It's a Valentine Cupcake Giveaway! If you would like to enter my giveaway, simply leave a comment on this post by Sunday, Feb. 8th at midnight. I will announce the winner on Feb. 9th and will send an email asking for the mailing address. Please make sure to leave your email address along with your comment. If I can't contact you, you can't win. For a second chance to win, go to my facebook page and click "like" at the top of the page. Then, come back here and let me know that you've "liked" me on facebook in another comment on this post. 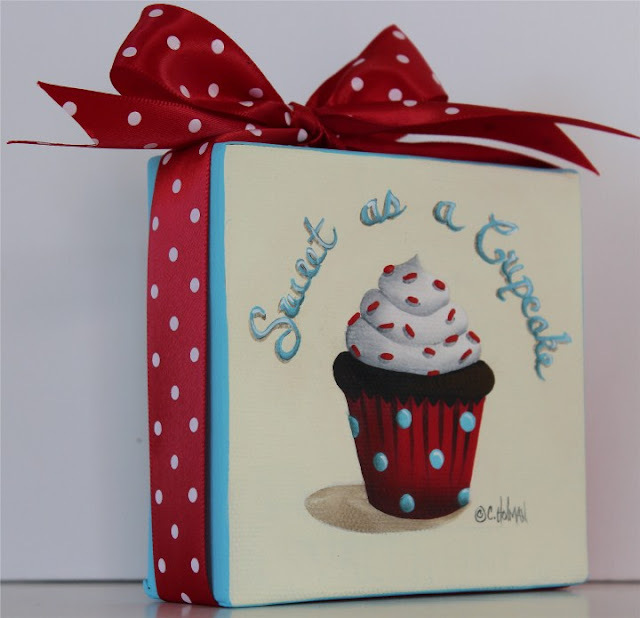 This "Sweet as a Cupcake" painting measures 4" x 4" and the 1 1/2" edges are wrapped with red and whited polka dot satin ribbon and tied in a bow at the top. Today is my daughter, Amber's birthday. I made these slippers for her and decided to make an extra pair for myself. I just love these colors! Here's Amber trying them on for size and photographing them from her phone. I think I'll have to make these in several colors. Why don't we all surprise her and stop in at Hoot 'n Annie and wish her a great day. As mentioned in the last comment, Sunday was the 5th and not the 8th, so I am closing the comments and announcing the winner in the next post. I would like to get it in the mail quickly so the winner can hopefully receive it before Valentine's Day. Sorry for the mix up. Love your paintings. Hope I win!!! I love the slippers they are just adorable and they look just as adorable on Amber. By the way, a Big Shout Out to Amber....Happy Birthday Sweetie!! Just letting you know I have "Liked" you on facebook. (actually for a long time now) Hoping to win the sweepstakes for this wonderful painting. I have been your facebook friend for awhile now! Love, love, love your cupcake art! I have one for almost each month and I switch them out in a frame on my kitchen counter. Just put in my valentine cupcake art! Keep creating! Cute slippers and darling cupcake painting. Love the colors. I will pop over and say "happy birthday!" to your darling girl. Love your cupcake, and the slippers are wonderful. Please enter me in your giveaway. I just left a Birthday note for Amber at Hoot'n Annie and I'm a new follower of Hoot'n Annie..
What a special day it is for you, its not only Amber's birthday but the day you became a Mom to a beautiful daughter. I love the slippers so much! and the colors of course just say "FUN"
Liked your page. Love your work, so hope I win!!! Happy Valentines and please put my name in the drawing! Love your work. So sweet. I love all of your cupcake paintings! I so look forward to each and every one. I would love to win this painting because my youngest granddaughter has a nickname of "Cupcake" and the painting would look awesome in her bedroom! Thanks! Count me in, Cathy!! Just adore your paintings and would be so honored to WIN one!!!! Will be "liking" you on FB too - I'll confirm. Also ... ADORE (wish I could enlarge that font to a lofty number!!) those slippers!! Were they knitted or crocheted? Just started knitting ... falling in love with fiber :) And, I couldn't agree more with your color choice. Hats off to you, Dear Cathie! Love cupcakes and lover your paintings!!!! Love the colors. Please enter me. Hi Cathie!! Please enter me in the giveaway! I love it!! Love the slippers you made your daughter and Happy, Happy Birthday to her!!! Love the painting - would look great with the little gumball cupcake painting we have. Slippers are adorable! What a wonderful give away! I love the cupcake painting. It is adorable! 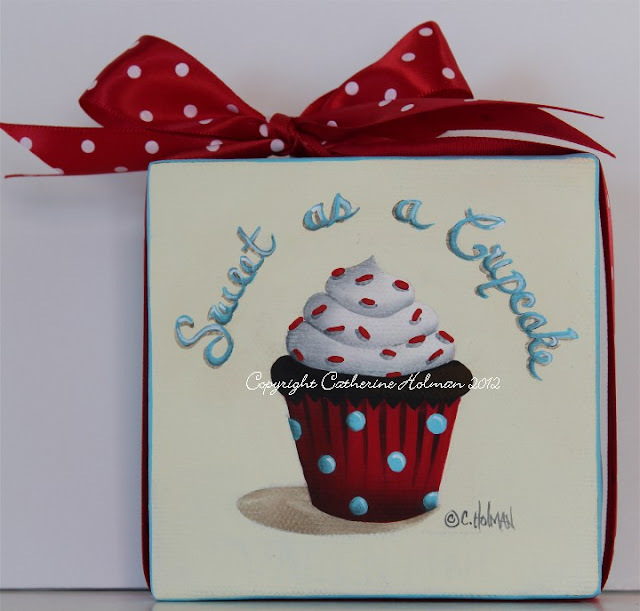 Oh Cathy I would love love love to own one of your adorable cuppy cake paintings! Count me in on this wonderful valentine give away! I liked your face book post about your give away! I've hinted to my hubby that I'd love one of your cupcake paintings for V-day. Wow I hope this is my lucky day..just happened to sign on and you're giving away what I want to buy! I 'liked' you on facebook also! Just found your blog, its lovely! Thanks for the super chance to win one of your lovely paintings. So sweet...who doesn't love cupcakes? Please count me in! stumbled across your page, GREAT..Love the paintings, I also liked your facebook page..
BTW isn't Sunday today the 5th?